Tomato Rice with Chickpea Soup | One Picture, A Million Words. Cold, wet, drab and gloomy – that pretty much sums up the first day of June. An appropriate meal for this miserable day has got to be a soothing soup. I fancied a tomato rice soup, a soup that is substantial enough for a main course and is a one pot meal to boot. The recipe for the tomato rice soup comes from the Gourmet Today cookbook. And because I can never resist throwing in a can of beans into my soups or pasta dishes, I added some canned chickpeas to the pot as well. The result was very satisfying. To quote my daughter, Lana, “I am really enjoying this. 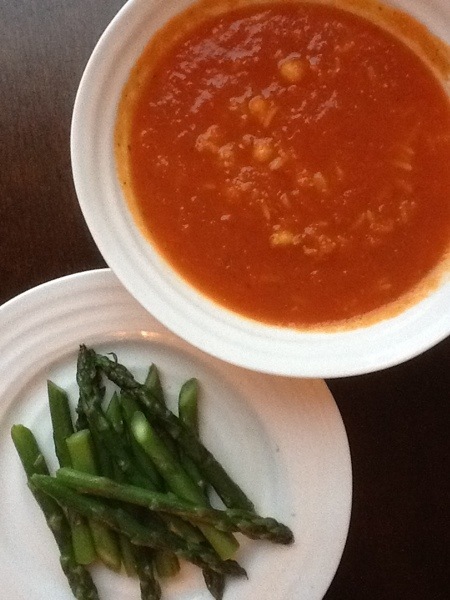 Mama, make this soup again!” Sautéed asparagus was served as a side. If you were here, you would be wearing cold weather clothes on your birthday. It’s strange that it’s cold in Toronto at this time of the year..